You can configure CES to send email alerts whenever a CES error occurs. This feature is useful to allow you to quickly react when important CES issues occur without having to regularly refer to the CES console and logs to monitor the system. You can set the alerts to be sent for any type of CES errors or only for fatal CES errors. A fatal CES error is an unhandled exception that stops the CES service and generates a core dump of the CES process state. As the CES process typically occupies several gigabytes of memory, the core dump to the hard disk can take a few minutes during which the CES service is interrupted. As the CES service is normally set to restart automatically, the CES service will become available again within minutes. Examples: Fatal errors can be caused by insufficient hard disk space, hardware errors preventing reading/writing to the hard disk, insufficient memory. Fatal CES errors will not occur when the Coveo instance is properly configured and has access to sufficient computer resources. It is recommended to configure the email alerts for fatal CES errors. Unhandled exception in Default-TrnManager - Alloc: Failed to allocate: 128 bytes. Used 3728660 k (peak:5131584k). Non fatal CES errors are significantly more frequent as they can be the consequence of a large number of causes. In real life several non fatal CES errors can occur daily. Configuring the email alert for non fatal errors can generate a significant number of email messages. For the index: document conversion error, script error, insufficient hard disk space for the compaction. For connectors: timeout or loss of connection with the repository, corrupted database, invalid XML returned, too many retries. Note: Errors occurring in Coveo Front-End processes are not logged in the CES log and therefore do not appear in email alerts. Sends an email each time a fatal or non fatal CES error occurs. Sends an email each time a fatal CES error occurs. In the Sender address box, enter the email address used by CES to send the alerts. 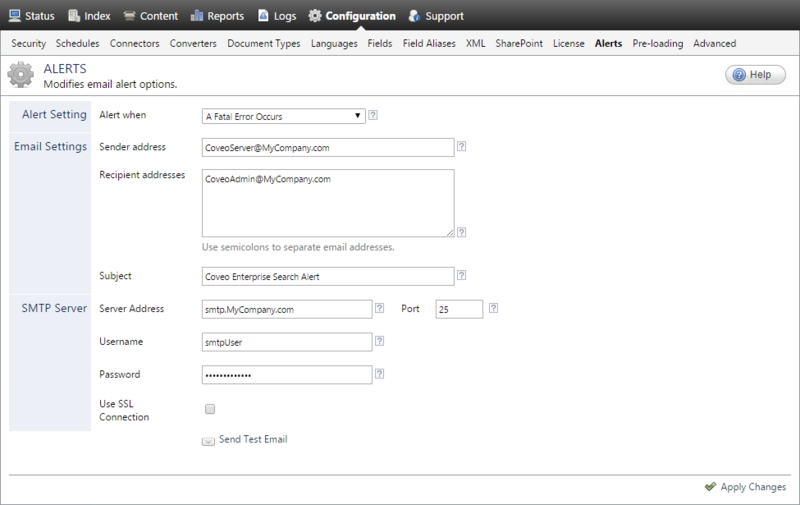 In the Recipient addresses box, enter one or more semicolon separated Coveo administrator email addresses to which CES sends the alerts. In the Subject box, enter text used for the email subject. In the Server Address box, enter the address of your SMTP mail server. In the Port box, change the SMTP port number when it is different from the default value (25). When your SMTP server requires authentication, in the Username and Password boxes, enter the credentials of a valid SMTP mail server user. CES 7.0.7338+ (January 2015) When you use an SMTPS mail server, select the Use SSL connection check box. Click Send Test Email to validate your email alert configuration. Verify that a CES email alert message was received by the recipients. If the test email is not sent to recipients within a few minutes, modify the configuration, and then Click Send Test Email again.